Head of the UNEP Regional Office for Latin America and the Caribbean Leo Heileman pays courtesy call on CARICOM Secretary-General Ambassador Irwin LaRocque. Greater Georgetown, Guyana – The United Nations Environment Programme (UNEP) has expressed strong interest in strengthening its collaboration with the Caribbean Community (CARICOM) to improve environmental sustainability in the region. Regional Director and Head of the UNEP Regional Office for Latin America and the Caribbean Leo Heileman visited the CARICOM Secretariat Wednesday and paid a courtesy call on CARICOM Secretary-General Ambassador Irwin LaRocque. He updated the secretary-general on work of the UN Environment Caribbean Office in Jamaica, which is providing technical support to countries of the region in strengthening their environmental capacity. Heileman also met with a team from the Secretariat led by Dr. Douglas Slater, assistant secretary-general, Human and Social Development (HSD) and officials from the government of Guyana. A UN environment coordination desk is being established in Georgetown to provide technical support during the elaboration and development of a Green State Development Strategy (GSDS). The CARICOM Secretariat is also involved in the consultative process of the GSDS. The discussions focused on strengthening collaboration in the areas of environmental sustainability, oceans governance, climate change, Guyana’s GSDS and regional developments in advancing green economies and trade. Heileman highlighted several aspects of UNEP’s regional and bilateral partnerships, including its work to advance Haiti’s green development via initiatives in agriculture, mangrove protection, renewable energy, and natural resource efficiency. The Secretariat underscored the importance of technical support for small island and low-lying coastal developing states (SIDS) to access funds for climate change and environmental sustainability available under the Global Environment Facility (GEF), the Green Climate Fund (GCF), and other funds. The meeting recommended that the CARICOM-UNEP cooperation be formalised in a Memorandum of Understanding (MOU). Both parties agreed that the formal mechanism for cooperation established between the CARICOM Secretariat and the UN System in July 2017 will be the frame of reference for the proposed MOU. 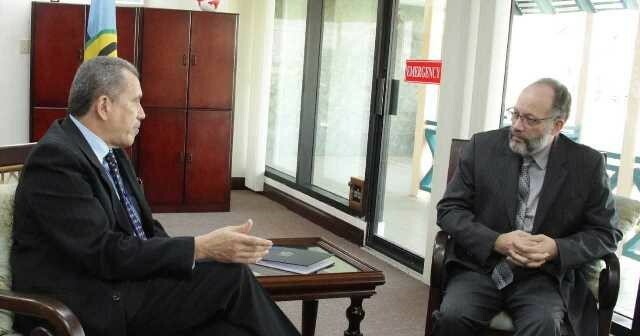 PHOTO Caption: Head of the UNEP Regional Office for Latin America and the Caribbean Leo Heileman pays courtesy call on CARICOM Secretary-General Ambassador Irwin LaRocque.